Sometimes you just crave a seasonal escape. 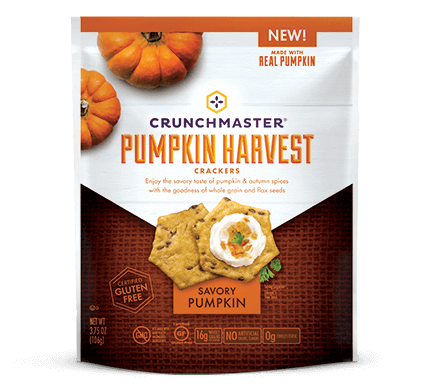 Our Pumpkin Harvest Crackers are the ultimate guilt-free indulgence. We start with real pumpkin goodness, add your favorite autumn spices and pack them with whole grains and flax seeds. Pair these crunchy treats with savory spreads or enjoy them all by themselves. Our crackers are made with the very best ingredients. Brown Rice Flour, Pumpkin, Potato Starch, Safflower Oil, Pumpkin Seasoning (Brown Sugar, Sea Salt, Pumpkin Powder, Onion Powder, Butter Flavor, Natural Cream Flavor, Spices, Garlic Powder, Yeast Extract, Canola Oil), Sugar, Flax Seeds, Brown Rice, Sea Salt. Contains Milk. Crunchmaster crackers use only pure, GMO free, California grown rice and U.S. grown sesame seeds. Our quinoa seeds are sourced from the Andean region in South America and our flax seeds are grown in the plains of Canada. By focusing on wholesome ingredients from trusted sources, we can craft simply delicious snacks to fit every healthy lifestyle. Explore our recipes to find one that suits your lifestyle or submit a creation of your own.